About two weeks ago I had a cold, so I went to the grocery store to buy some orange juice. Tropicana is my favorite brand, so I looked and looked but couldn't find the regular Tropicana container with the big orange on the side with a straw punched into it. 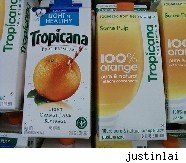 It took me a few minutes, but I found Tropicana's new OJ box that looked so generic that even when I got it home, I thought it was a cheaper, generic brand made by the grocery store chain I went to. It wasn't. It was Tropicana, and I wondered why the company would change its logo. What better way to show freshness than an orange with a straw poking out? Apparently I wasn't the only person wondering what had happened to the old packaging, or why the company would change its logo. A recent story in the New York Times reports that the PepsiCo Americas Beverages division of PepsiCo bowed to public demand and is going back to the original packaging. The redesigned packaging that was introduced in early January is being discontinued and the older version will come back in the next month. The glass of orange juice in the new carton was so big that it really didn't look like a glass of orange juice, but just a big orange swath of color. It had a generic brand look to it, like it should be a lot cheaper than it is. I didn't write the company a letter, but some of its hard-core customers did. Some called the new packaging "ugly" or "stupid" and resembling a "generic bargain brand" or a "store brand," according to the Times story. The passion convinced company officials to change the packaging back to what it had been. It wasn't exactly a "New Coke" move, but close without having changed the content. The taste, alas, didn't change. Want to see more makeovers? Check out WalletPop's gallery.